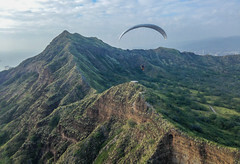 An anomalously strong Kona flow today brought ten pilots to Diamond Head, and seven of them flew, some for many hours. I'm not sure why it was working that well. There does happen to be a front approaching Kauai tomorrow, but this didn't seem like a true prefrontal flow. I wonder if it wasn't just a stronger than usual effect of the surface ridge parked over us that has been producing these consistent southerlies. A few days ago we noticed the forecast seemed to suggest the possibility of strong enough flow for Diamond Head on Thursday, but later prognoses didn't look as positive, so most of us had stopped thinking about it. But Jeff was on it. He made the call this morning and headed out, launching and flying completely alone. He texted me a picture of his boots above the lighthouse, and I dropped everything and ran out the door, texting everyone I could think of and posting on the chat box. Thanks for the heads up, Jeff! Conditions started out strong enough for Jorge to fly his little acro wing, but by the time I showed up he had landed and had switched to his big wing. I launched in pretty light flow, but it wasn't hard to get up at that point. But it got progressively lighter throughout the day, and the last few flights were pretty short. The vog was pretty thick over the island, but it was clearer where we were flying. Roll call: Jeff, Jorge, me, Bill, Kaaawa Larry, Thom, Vin, UT Mark, TommyRD, and a visiting pilot from Minnesota, whose name I didn't catch. Glad the more worthy got some! When I got there it had started to get light but felt doable. Flystrong started at East Launch went to West got up and directly to the beach, so I went back to East. Flow was straight in. I got up out of East on 2nd pull, it was interesting but got an hour and half flight, in easy air. When it started to shut down you could feel the sink. Set up for a top land but felt it was going to be too fast with no wind so hit the beach. Something about Diamond Head even though its a little ridge can't seem to say no to her and she's been good to me. It was alternate wing day as I flew my Cayene4 and Alex flew his very faded 1000 hour Peak6......but it has new lines. Jorge made a comment, everyone is flying their ugly wings, or something like that. Always a treat, thanks for the post Jeff!! Glad you got some flights, 2 I think right, with a top 'land'.